Among the vagaries of using cruise ships as transportation is the fact that satellite internet is notoriously fickle. We left Hong Kong several days ago and published a brief post about our wonderful private tour with a Tours-by-Locals guide. Unfortunately it never did get posted and the draft went missing. However, although we’ll tell a more in depth story when we regroup at home later in May, it needs to be said now that there is no better way to see a city than with a private guide. We taxied up to Victoria Peak, traveled down by funicular, rode the subway to Kowloon, explored traditional markets on foot, enjoyed the local bus system in the pouring rain, rode the Star Ferry back to Hong Kong Island, and ate dim sum for lunch with the local population. All of this was because we had Jacky to lead the way. 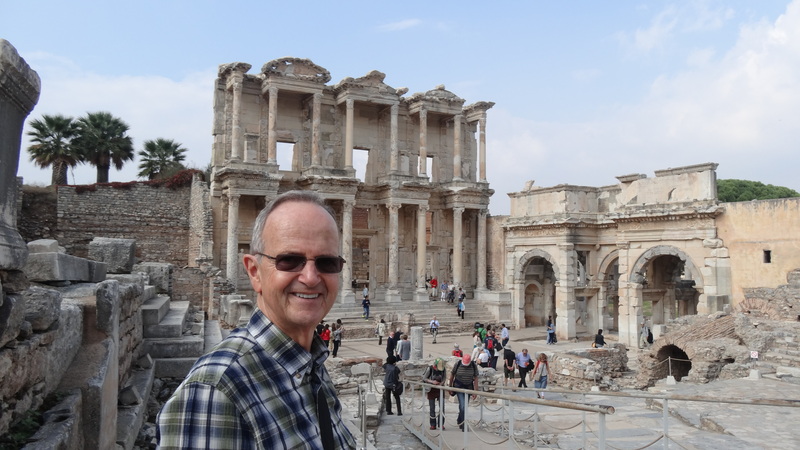 Art enjoying a tour of the ruins at Ephesus with our private guide. We’re just back from another wonderful travel adventure that took us from London to Istanbul with many fabulous experiences in between. We began with three exceptional days in London to visit our son, then flew from Gatwick to Rome where we spent three days on self-guided walking tours. After Rome, we boarded an Oceania ship and set sail for various islands – Crete, Sicily, Santorini – then Athens and Turkey, ending in Istanbul. Along the way we did some touring on our own, a few of the dreaded “shore excursions” (we’ll tell you about the good and bad of those in the upcoming posts) and several private tours. There is little doubt in our minds that when you need to be guided around a new-to-you city where there is a significant language barrier (and sometimes even when there isn’t) you cannot beat a private guided tour. We’ve had private tour experiences in places like Costa Rica, Tahiti, England, France and Ireland among others, but our recent sojourn in Turkey reiterated for us the myriad reasons why for us it’s one of the very best ways to experience a culture. 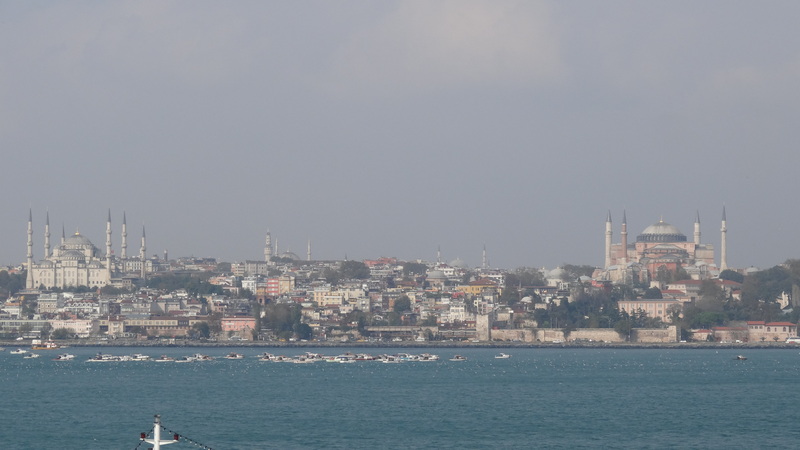 Arriving in Istanbul by ship. The tour really began months before as we searched online for the ideal tour. We had used several tour companies previously – with great results – but this time those ones didn’t really have what we were looking for. During the research we discovered a company called Tours By Locals. Based in Vancouver, this Canadian-owned company has local guides seemingly all over the world. 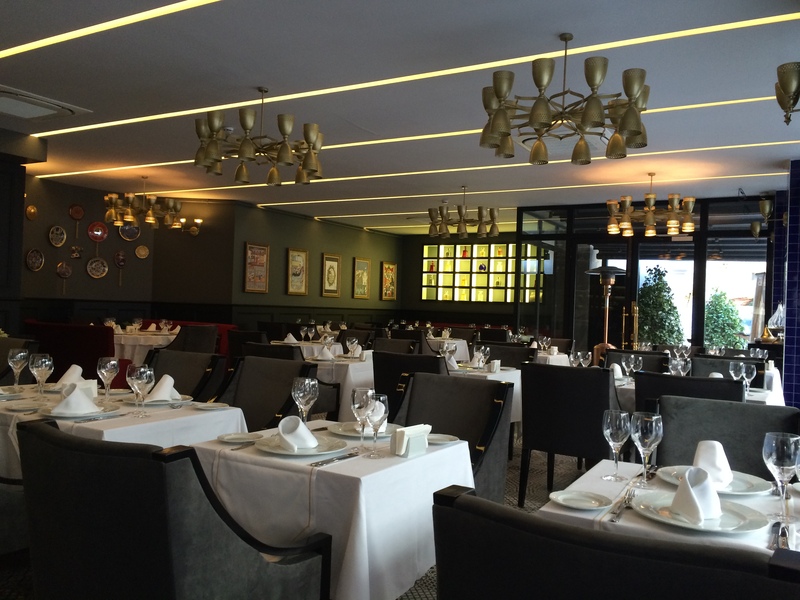 We zeroed in on Istanbul and found that their presentation of the guides was fascinating. Each guide was showcased by personally-written biographies, a listing of credentials and the all-important feedback and ratings from previous customers. We zoned in on a young man named Emre Ozkara and contacted him to see if he could accommodate our needs in Istanbul. This company permits you to make the arrangements directly with the guide thereby eliminating communication barriers and allowing you to get to know your guide through email. Then, when you have come to a decision about the tour, the guide prices it for you, uploads it to the company, and the itinerary is sent to you via the company’s web site. You pay the company who then pays the guide after the tour is over. For a discerning traveler, knowing that you have third-party recourse is comforting should anything go wrong. We were happy with this layer of security, so we booked the tour. Emre did his homework and emailed us to let us know that he had noted that our ship would actually be docking in Kusadasi down the coast from Istanbul several days before our final disembarkation and private tour days in Istanbul. A home-town boy from Kusadasi, Emre indicated that he would be visiting his family at the precise time we were there and did we want to add a day tour to the ruins at Ephesus to the Istanbul days? We had already booked a small-group tour of the ruins through the cruise line, but the price was almost identical (!) and we thought that we would, indeed, prefer a private tour. Since it was early enough to cancel the group tour and get a refund, we went ahead. We were very glad we did. 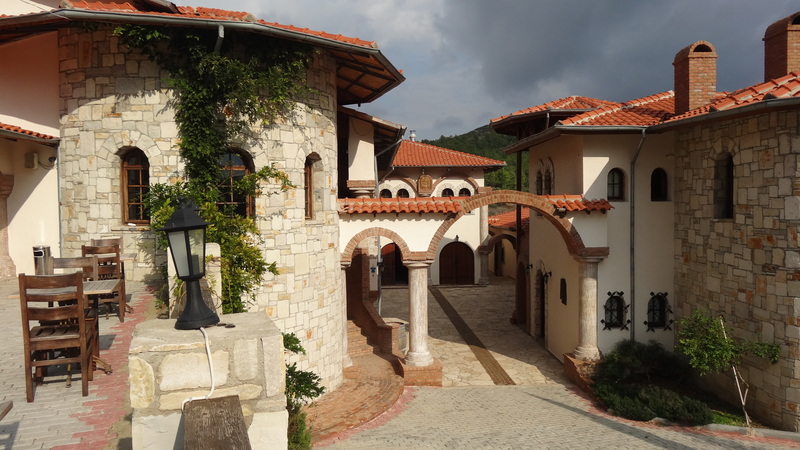 Seven Sages Winery & boutique hotel near Ephesus is worth a visit. Just as promised, Emre was waiting for us at the cruise terminal in Kusadasi where he whisked us off in a BMW 4X4 to Ephesus (more about that in a later post). While we were driving to Ephesus, he got to know us a bit better discovering that in addition to history and culture, we are also interested in food and wine. After finding that we would be happy with lunch at a boutique winery (we were not aware that Turkey had such places), he made a call and the arrangements were complete. To say that our day with our private guide was fabulous would be an understatement, but we didn’t’ know at that point how fabulous our time with this guide would be. Three days later, as arranged, we were picked up at the cruise port and had a general orientation to Istanbul before checking into our hotel. The next morning, Emre and his brother who was to be the driver arrived at the hotel to begin our in-depth two days touring the magnificent city of Istanbul. An extraordinary ability to tell a story – not relay facts. Deraliye Restaurant in the old city in Istanbul. This is what we got. Imagine sitting on the carpet at the back of a quiet mosque in the heart of Istanbul (after visiting the bigger tourist magnets like the Blue Mosque) and listening to a story about the Muslim way of life and how this religion is a part of but doesn’t define the Turkish culture. Our understanding of Islam now goes far beyond the front-page stories we see on a daily basis in the media. Emre knew that we were interested in this story: not everyone would be, but he had gotten to know us and we asked the questions. He also arranged two wonderful lunches including one at Deraliye, a new Ottoman food restaurant that had searched out and presented twelfth and thirteenth century dishes. What a great experience! After our days in Istanbul, we were dropped at the airport as we requested in the tour package. We were truly sorry to say good-bye to our guide who had made us feel that we had shared a bit of his culture and his home. What a way to go! Stonehenge: Mystical or just mysterious? Costa Rica: It really is as terrific as they say!